Defense provides cushion for Tuskegee’s new quarterback. Clark Atlanta came into Tuskegee on Saturday afternoon looking for a signature win to validate their championship dreams. Tuskegee wasn’t sure what to expect with a quarterback making his first college start. What they got was a 30-16 win in their home opener. With Jamarcus Ezell in concussion protocol, it was Ahmad Deramus under center for the Golden Tigers. The sophomore found out on Thursday morning he would get his first start since high school. The defense did their part to give the kid a cushion. Darnell Hill picked off Johnathon McCrary on the Panther’s first drive of the game, scoring a 47-yard touchdown. Two minutes later Carlos Saldana couldn’t handle the snap on a punt deep in his own territory. He kicked it out of the end zone taking a safety over a potential touchdown. That put Tuskegee up 9-0 after just three minutes into the first quarter. Later on a punt return, CAU couldn’t secure the ball and gifted Tuskegee with another turnover. By gift, I mean a touchdown. The ball bounced through arms and between legs until Joshua Mincey cradled the fumble for a touchdown. Saldana put the first Panther points on the board with a field goal at the 5:58 mark of the first quarter. CAU caught a break on the ensuing kickoff when Tuskegee fumbled the ball. McCrary immediately went to work finding DeAndre Jackson for a 28-yard touchdown. 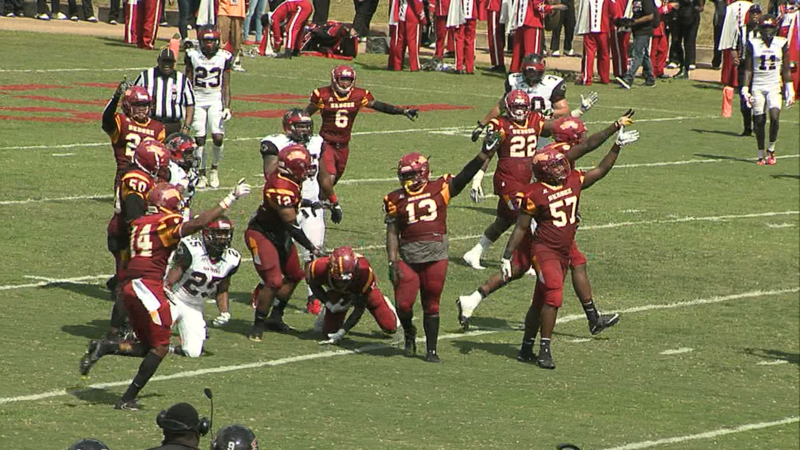 The extra point making it a 16-10 game, still in favor of Skegee. Deramus proved in the second quarter that no matter who is in the game, Tuskegee is good for a 50 plus yard play. He hit Javarrius Cheatham for a 61-yard pickup down to the CAU nine-yard line. That set up an Eric Bright touchdown and a 23-13 ball game. Clark would manage one more turnover before the half when Jajuan Lankford fumbled on a first and goal run. Tuskegee ran out the clock to halftime. Saldana would trim the lead in the fourth to 23-13 with his third field goal of the day after neither team scored in the third. However, Clark Atlanta simply couldn’t get out of their own way. On 3rd and 10 with just over two minutes to go, a strip sack fumble brings down McCrary at his own 15. On the next play, Marquez Burdett hits the hole for 15 yards and a score and that was the ballgame. Clark Atlanta (2-1) loses the first game of a tricky three-game road trip. Next week they visit Lane before facing off against Grambling in the Chicago Classic. Tuskegee (2-1) avoided falling under .500 early in the season with the bounce-back win. Ezell will continue to be monitored under the concussion protocol, and for now, Deramus stands by ready for his number to be called again. The Golden Tigers head to Findlay, Ohio next weekend to take on the University of Findlay.